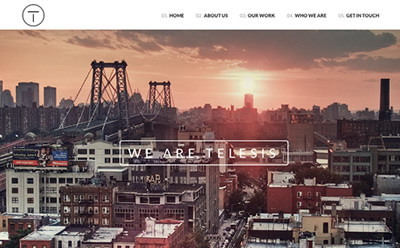 Telesis is a one page WordPress theme for creative companies and individuals. The theme is 100% responsive and with a nice parallax effect. The theme comes with an advanced customizer that allows you to change theme colors and other aspects without touching a bit of code. Among other features are a portfolio slider and integrated social media icon fonts. 100% responsive design that works great in every device. Full screen slideshow on top. Integrated lightbox for each portfolio post. Ability to replace the featured image with an embeded video in the lighbox view of each portfolio post. Theme customizer that allows you to change colors and other aspects without touching code. Integrated social media font icons, 11 icons available. Easily upload your logo image. Includes styling for Contact Form 7 plugin. Delivered with .png source files. XML file to install demo content. I can’t thank you enough, and I am very impressed with the elite customer service experience I have had with you. Thanks so much for all of your help… your themes are great, and your attention to service is fantastic. I’ll definitely look to you for my future WP theme purchases!! Thanks for your help. Viva support, as usual, has been excellent. Good product and great support – hard to find these days. Moving websites isn’t ever as easy or as simple as you imagine when you start out. So having Viva Themes respond to us within 24 hours every time we called for help was a massive win. He was also to the point and ‘easy to use’. It never felt like we were being a pain, and he always gave clear and simple instructions. So simple even I was able to follow. Ever since I purchased my theme from VivaThemes.com, I have received unparalelled support from the staff. In fact, every time I had a question or needed help with something in the code, the staff at VivaThemes replied very promptly. In regards to the theme, I can’t say enough about the level of professionalism it conveys for my business. I feel very comfortable referring potiential clients to my site – it is one of my best marketing materials. Thank you so much for the fantastic theme and all of the support, I look forward to more great themes in the future! Buying the Revival theme was a great decision. The template is beautiful and very easy to edit. If you look at the site I build with it I have just touch little things… and not just me… even many friends and other people say to me that the final design is amazing… and i laugh when i get realized that i have just worked not more than a week on it! Thanks Vivathemes, thanks a lot! We bought the Revival theme, and it has been one of the best investments so far for our business. A very clean and custom theme that gives you a fantastic framework to start with! They answer both on Twitter and e-mail. We will buy our future themes from Viva, for ourself – and our clients! Taking on the responsibility of building a web site for my organization was daunting, but with the immediate help of Mike and the user friendly designs I’ve been able to present a product that my boss is not only content with, but ecstatic about. The immediate response from Mike for tech support was not only pleasurable, but simple and to the point. I would recommend VivaThemes to anyone interested. J’ai acheté un thème chez Viva et ai été surpris de la rapidité et de l’efficacité des réponses qui m’ont été fournis. L’Equipe m’a aidé à régler tous mes problèmes, les thèmes sont bien codés, fonctionnels et très bien pensés. Le package envoyé permet de bien comprendre les fonctionnalités particulière de chaque thème et les fichiers transmis, de pouvoir retravailler le thème le plus facilement du monde. Un grand merci à l’équipe, qui j’espère, continuera à nous faire profiter des ses talents ! I needed a professional theme but straight forward layout and navigation. A microsite if you must, Delirium almost read my mind! Everything i could want in the theme was there, and the fantastic theme customisation panel gave me total layout control. I simply edited css colors, images and in less then an hour i was up and running – would have been quicker if i wasnt gawking over the well written code. Viva Themes has been great, they quickly responded to my questions with straightforward answers. Their WordPress themes are not only great looking but they are easy to modify, even for someone with no previous experience like me. I looked around at many different places for a theme for my company website and chose Viva Themes for their great pricing, ease of use (love my advanced theme panel), and customer service. So many WordPress themes are fine for blogs, but useless as a small business Web site (WordPress is a handy CMS after all). That’s why I’m overjoyed to say “thanks” for building themes with home pages and other Web site goodies. I’ve already built a site using Delirium, and while I’m not techie/Web developer, I was still able to create a site that made my client very, very happy. I purchased the complete themes pack, and expect to roll your themes out for other small business customers. Great work! I used your Revival theme for a client’s wellness and pilates business. The process of modifying your theme for their branding and color was simple. Good job. I just wanted to thank you guys for your themes and the fantastic support. My company develops websites for small businesses and entrepreneurs and no matter how expensive I have yet to find themes to compete with the high quality and service that you provide. I look forward to seeing what other themes you develop! I am not a web designer, but I had a short deadline to make a website for a luxury leather brand for the Japanese market- in Japanese. WordPress was still fairly new to me, and while I knew that there were thousands of themes available, they were either too expensive, too chintzy or otherwise not appropriate. That was until i found Viva Themes. Several of the themes were exactly what I had in mind and in the end I chose Delirium. I had a couple of problems and had to contact them. They were extremely helpful- very fast, courteous and more than willing to help me solve my problem. I am so glad I went with with Viva Themes- not only for the great website, but also for the fantastic service. Thanks again. I will definitely be back. I wasted a day of my life looking through thousands of free themes, then I found you guys, 5 minutes & $48 later and I was completely happy. The Space + Color theme was exactly what I was looking for and more, my client was bowled over by it and I must say using it really raised the standard of the project. If you cost a day of wasted productivity and stress against finding a superb solution in 5 minutes for such a great price it doesn’t take a genius to see the best option. I think Viva offer the most stylish and reasonably priced themes available and will most certainly be purchasing more. Your themes are very clean, simple and easy to customize. All of my questions were quickly answered via email and the Space+Color theme worked perfectly for a site I did recently. Thanks for the awesome theme! As a very new and inexperienced user of WordPress and having very little experience of building websites at all I thoroughly reccomend Viva Themes to you. I used the Prospectum theme to build my website and it is so easy to use and is superbly customizable. I also recommend Mike to you as he is very supportive and as a newbie ‘web designer’ I probably drove him to distraction with my queries regarding CSS – all of which were answered promptly with easy to understand answers. I have little knowledge of the WordPress template business but these products are ludicrously under priced in my opinion. GBP 27.00 is the bargain of the century! I needed to put together a quick, but powerful website for my friend who was using an iWeb website previously and I came across your theme and loved it. It was really well built inside and out and I didn’t have hardly any trouble tweaking it and making it fit our needs. You guys make great themes, period. After purchasing Prospectum for my business website, I decided to buy L’Image for my hobby photography site. Most photography themes are too blog-like to work well as portfolio sites, but L’Image manages to do both. The way the theme manages the photographs, in categories, is clever and extremely effective. Apart from a logo, I hardly made any changes, it just looks good and is very easy to use. Highly recommended. Just wanted to drop a line and let you know how extremely impressed I am with the service of Viva Themes. I am an ABSOLUTE newbie to websites & can’t believe how fantastic my site is looking already (I’m only 1/2 way there, sorry I am sure their will be a few more questions coming your way). Thanks again for the help, I will be recommending you far & wide. I have been so pleased with your themes and particularly your outstanding customer service. The reason I chose the All Themes Pack was due to my positive experience purchasing two of your other themes. It is refreshing to be able to purchase a web developer product and have a pleasant experience – doesn’t happen often! Just a short note to say thanks for creating the wonderful themes and for hard work and commitment you offer to your customers. There are a great many people benefitting from your work and I’m looking forward to seeing what arises for you and us in 2011. All the best. I just wanted you to know that I am extremely impressed with your level of service. It is such a rare thing these days to find someone who stands behind their products and helps people out when they get stuck, as I did. I will not hesitate to recommend your company and themes to others, and I have just passed your information on to a couple of software developers I know (they were shocked and amazed at how quickly you responded to my needs). Thank you very much again… you have gained a new and loyal customer! As a web designer and developer, I always start with a Viva Theme with my website projects and customise from there. I have used over one hundred themes – in my experience Viva Themes has the cleanest code, best flexibility, speed performance and cross-browser compatibility. The hard part is done, leaving me to do the fun customization work. I must say that this is by far the best costumer service I have experienced, and also one of the better WordPress themes I have come over. I just wanted to tell you I think your themes look amazing. I have used only one, but whenever I have a new idea or something, I come to your site for inspiration. I keep looking because I think one day, I will find a project where I can use one of your great designs.